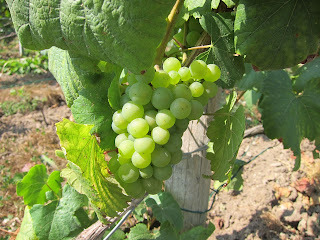 Much of the time I write this blog for wine geeks. But not today. I have been bubbly shopping with friends who drink wine but don't obsess on it, and I've seen their eyes glaze over if I get too detailed. If that's you, here's a very simple guide to buying sparkling wine you'll actually enjoy. Why do that? Well, why drink anything you don't like? If you're going to drink the stuff on Dec. 31 anyway, why end the year with a bad taste in your mouth? Plus, you know all those movies and rap songs that mention how great bubbly is? Well, it really is, if you know what to buy. And you don't have to spend $300 for Cristal to live large. So here are the 8 simple points to getting a sparkling wine you'll actually like. Give it a shot. That's not so much money for a bottle with about 6 drinks in it, especially if those drinks actually taste good. Good sparkling wine costs more to make than still wine. It has to be fermented a second time in the bottle (that's what "traditional method" or "methode Champenoise" means). If you spend less than $15, you're getting wine that was carbonated like Coke. It's not the same. I know $20 is a lot of money for a bottle of wine. But give it one shot. At least you'll know what the rappers are going on about. Supermarkets bring in cases of the crappiest bubbly they can find just for this week. I went to several supermarkets this month that didn't have even one bottle of sparkling wine I would personally drink -- and a couple were goody-two-shoes higher-priced stores that supposedly sell quality food. I'd like to see you go to a smaller wine shop where you can talk to the staff. "What's the best bubbly I can get for $20?" is a perfectly fine question; it says all you need to say. But even giant chain wine stores have some bubblies worth drinking this month. These are the main grapes of Champagne and they are the grapes of all of the world's best sparkling wines. Seriously. All of them. 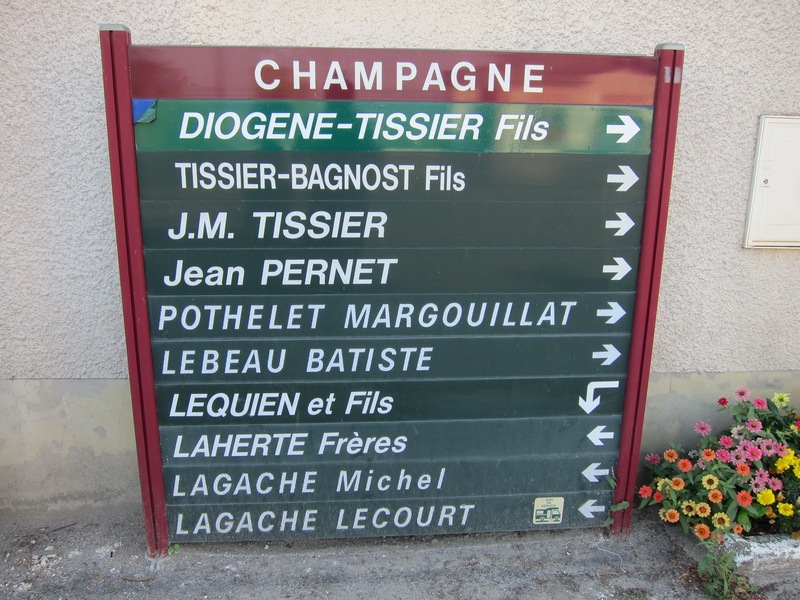 Champagne is a place. This is what it looks like. Actual Champagne from France (Champagne is a real place, east of Paris. Great war history there.) will not list the grapes on the label because they're understood. But other wines made from Pinot Noir and/or Chardonnay usually will, because it's a marketing plus. If you see other grapes mixed in, that's probably a minus. Because otherwise, you might as well buy white wine and add 7-Up. The Gloria Ferrer and the Gruet might be found as cheaply as $15 and are the cheapest bubblies I'll personally drink. I'm not a fan of Cava; the grapes aren't as good. I have had some fun Proseccos but while they're cheaper than good Champagnes, they're also more rare and you'll need to put more work into finding them. And Prosecco's ceiling just isn't very high: if I get one as good as the four cheap bubblies I listed above, I'm shocked and delighted. I'd love for you to try an actual Champagne, something not too expensive (say, $30) that's still pretty good, like Nicolas Feuillatte, or a small-production Champagne your wine shop recommends. I'm not a fan of the most widely available Champagnes, Moet & Chandon or Veuve Clicquot: US bubblies in the same price range, like J and Schramsberg, are better. 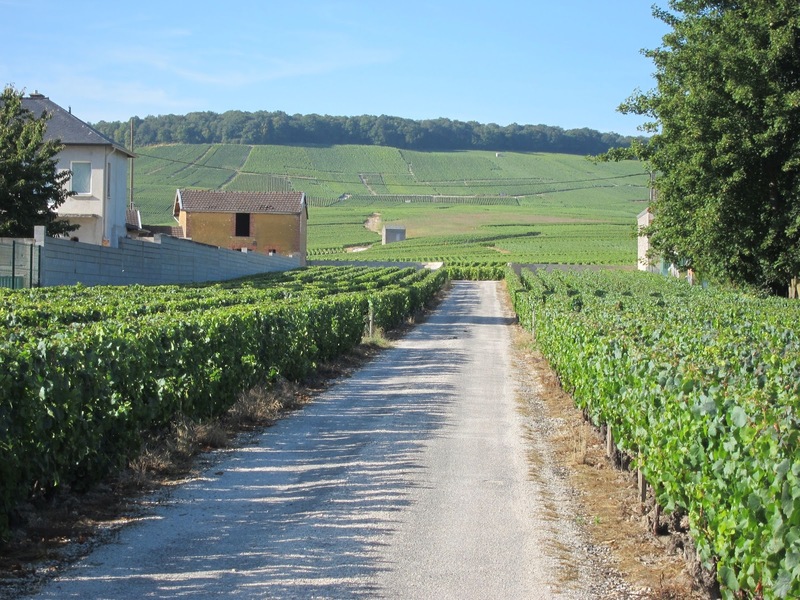 Crémant de Bourgogne ("bubbly from Burgundy) is often good value because they grow the same grapes as Champagne but charge less for sparkling wines. Champagne is actually terrible with wedding cake, another reason people think they don't like it. Sweets make sparkling wine taste bitter. A solution is to get a pink Champagne, which is sweeter, but good ones cost about $10 more than regular Champagnes. And all we're trying to do here is get you through one bottle with a good experience. Foods that are good with good sparkling wine include plenty of stuff that's around on New Year's Eve. Buttered popcorn is great. Potato chips are great. Pretzels are good. I'd drink Champagne with nachos (hold the jalapenos, though). You don't have to get fancy. Just think salty and crunchy, not overly spicy and not sweet. The trend in Champagne glasses used to be wide and flat; then it was tall and thin. At home, I drink sparkling wine out of regular white-wine glasses. You get more aroma than with a flute (the tall thin ones), and the bubbles don't disappear like they did with the glasses your grandparents used. A red wine glass or water glass is probably too fat; the bubbles won't last. That's all. Spend the $20. What have you got to lose -- besides $20? $20.00 is little to much for me at this time I'll stick with my fav. Mad Dog 20/20 with 7up for the bubbles of course. Have Safe and Happy New Year. There are a good number of Spanish Cava wines well under the $20 mark. You can also find good deals on Domain Chandon and Gloria Ferrer at the Safeway, about $12 to $14. Joe: Cava doesn't taste as good as wines made from Pinot Noir and Chardonnay. I strongly discourage shopping for sparkling wine at Safeway. Strongly. I'll bet those sale wines are the weakest in Domaine Chandon's and Gloria Ferrer's portfolio. There are people who don't like Champagne? ; who read this blog? Rapo: I'm hoping folks will find this by search, or that my enophile readers will forward it to their non-enophile friends. I have had the same conversation with several non-enophile friends this year: Why don't you write more for people who don't know much about wine, but are interested in learning more? Gotta start somewhere. I read this blog and I haven't yet met a Champagne I enjoy drinking on its own (though I love a champagne cocktail). I am hoping to edumacate myself, at least insofar as my budget permits. Victoria: That's interesting. Pinot Noir isn't a traditional Cava grape, but here is one instance where I like internationalization, because it just makes a better sparkling wine (I can feel the traditionalists grumbling). What's your budget and what's the nearest big city to you? Let me see if I can suggest a one-last-shot Champagne in a nearby store. Oh man, I think back when bubbles used to just be a New Year's Eve thing and I feel bad for my past self. Now, the wife and I drink bubbles at least once a week, more if we can. Despite being expensive to make, sparkling wine has one of the best QPR of any wine. 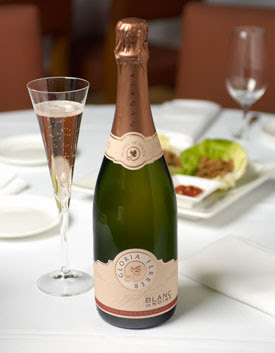 The local wine shop often has Gruet Blanc de Noir for under $20 and for that price, bubbles become a daily drinker! Blake: A great primer for the uninitiated. Well done! Perhaps we should make you an honorary member of the Society of Wine Educators. Christopher: I could drink bubbly every day. I'm always just a little sad when I meet a wine drinker who says she doesn't like bubbly. You'd be amazed how many people get a gift of a bottle of Champagne and never open it. Pop those corks! I missed the twitter discussion of English bubbly, but have two bottles of the Ridgeview Cavendish, if you want to try it. It may end up a Tour de France wine. I'm traveling for the holiday--currently in Baltimore. The population of the party we are going to tonight is, erm, perhaps less advanced on this evolutionary track than even I. I don't think I'd spend more than $20 on an offering. If we are stopping to pick up a bottle or two, I figured on following your recommendations in the original post. For purposes of my own development, though, I live in Manhattan and would appreciate any suggestions you might offer! Oh. Right. Budget. For common-or-garden wine, having a glass with dinner etc., I keep it below $15. But every so often I will go up to $20 - $25 for special occasions or just if the spirit moves me. The chief thing I haven't liked about Champagne thus far is that it always seems to taste ridiculously acidic to me, although I do like dry wines on the whole. Maybe this is the fault of drinking relative plonk. Victoria: Thanks for the note about the acid. I'm going to second your local wine shop's suggestion (local wine shops know!) and suggest you drink something pink. Good pink Champagne starts at about $40 so I'll suggest you try a Crémant. Louis Bouillot Crémant de Bourgogne rosé is under $20 most places and is pretty good. 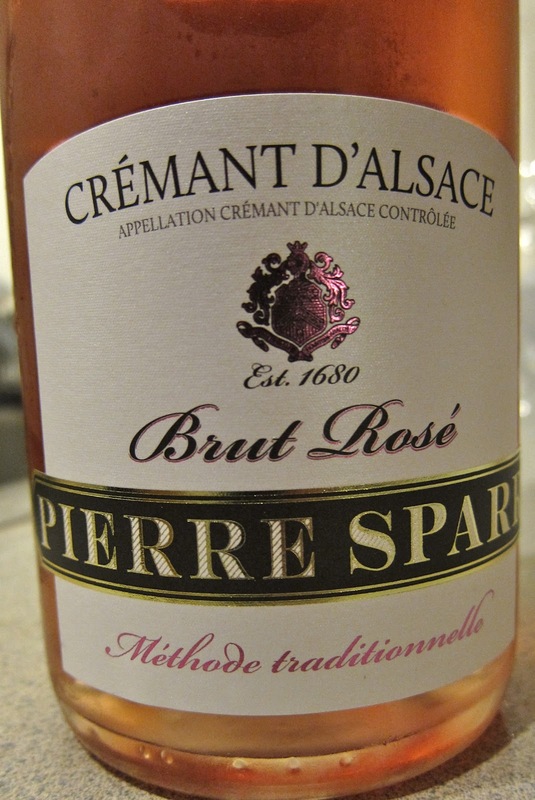 The Pierre Sparr Crémant de Alsace I ran a photo of is also under $20. Stick to pink with your friends tonight as well. It's cheerful and easy to drink. Why start the new year painfully? When you get home, try Astor Wines. I looked at the Champagne stocks of several Manhattan stores and they seem to have the best combo of price and selection. I don't know how helpful the staff is -- that REALLY matters. If you want to give Champagne, non-pink, one last try for now (tastes change with age, as you gradually lose the ability to taste bitterness, which is why older people like Scotch. Seriously), maybe give Perrier-Jouet Grand Brut a shot at $34.97. Victoria: For Baltimore wine shops, not many seem to have their inventory online and one that does says its prices change every day, which is not confidence-inspiring. Best I could find for you is Bin 604, which has Gruet Blanc de Noirs for $15.99. That's what I'd drink tonight if I were you. And if I were you, I'd raise a glass in the direction of Camden Yards and say, "Thanks, Buck." Good recommendations. My wife and I drink bubbles throughout the year. There are some awesome bottles that cost between $18 to $25. No offense to the Gruet and Ferrer brands which are fine, but for a couple of extra dollars one can buy Cremant Du Jura and Vouvray as well as other sparkling bottles made of Gamay or Grolleu from the Loire or Fallanghina from Campania. I recognize we are spoiled in the Bay Area with so many excellent wine shops. They offer wines infinitely more interesting than Gruet or Ferrer for a couple of extra bucks! I've enjoyed reading your blog Blake, you are right up there in my reading with Mike Steinberger, Dr. Vino and Brooklynwineguy. Have a happy new year! For tonight, I'll just have to see what our choices are en route. Happy New Year! I intensively read about champagne for professional reasons and it's one of the most sensitive introduction to sparklers I've read. 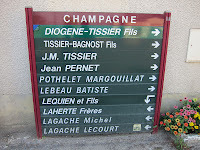 To give a better chance to champagnes you should maybe raise your price bar to 30 $. Thanks, David! You're right, $30 is much better for Champagne, but my main comment from non-enophiles has been that $20 is a lot of money.